TeachMeet has been shortlisted for a Naace ICT Impact Awards. This is in the Collaborative group project, In recognition of the way this radical form of CPD is transformative. For one reason or another my name has been attached as representative. 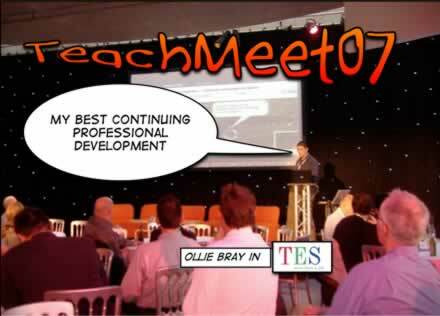 Obviously I can take no credit for TeachMeet or its impact, by dint of the fact that I’ve been in the fringes of TeachMeet since its inception I can, with a ton of help make some sort of representative. My history with TeachMeet is long but not deep: I’ve attended a fair number, in the flesh and virtually; I’ve presented at a few; compared one; provided a bit of casual tech support and blogged a bit. All shortlisted nominees are being invited to submit a short edited video (of no more than 3 minutes) – perhaps working with their pupils or colleagues – which demonstrates the impact of the work that you’ve done. Please note that entries will be judged on the basis of impact rather than video quality. I am quite relieved the TeachMeet’s impact will judged on my video editing, but realise that I am not capable of demonstrating the impact of TeachMeet. I though the best way to do this would be to crowdsource the video. Given the rather short time frame for a collaborative project (All videos must be submitted to Naace by Friday 3rd February 2012) I think it best to keep it reasonably simple. My idea is this: TeachMeeters send me some images, text, slides, cartoons, audio snippets or even micro videos showing the impact of TeachMeet. I mash them up into a 3 minute video. We have 3 minutes to fill, so you should probably keep audio and video shortish. I’ll feel free to chop up anything sent. Tweets with #TeachMeetImpact will be grabbed by ifttt and saved on my delicious account. Send me the media via email (DM me if you want that).